In Margaret Truman's latest mystery, the scene opens with an obscure death in Washington's Foggy Bottom, home of the State Department, shifts to mass murder in the downing of aircraft, and then moves on to mayhem in the streets of the new Moscow. Firmly ruling out coincidence, investigators seek means and motive. The means are soon apparent: small-scale weaponry with large-scale impact. Their country of origin? A place where nearly everything--hardware, information, love--can be found for a price. Max Pauling, a State Department investigator, seasoned, good-looking, and hard to fool, quickly takes off on a trail still as warm as the smoking wreckage. A host of vivid characters people the narrative, including a lovely State Department analyst who finds herself attracted to undercover types; a militia leader in Idaho who leads his people into gunfire; a reporter at odds with his boss but not with a good story; and a secretary of state who loves baseball slightly more than her job. 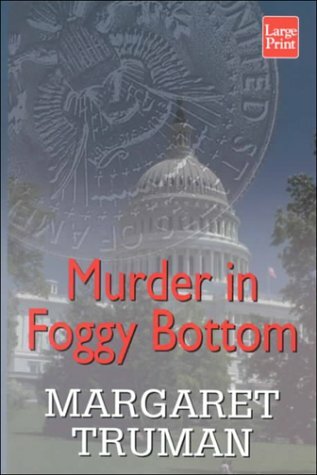 Fast-paced and informative about flying, food, statecraft, and the violent "wetwork" under the dryly elegant exterior of diplomacy, Margaret Truman's Murder in Foggy Bottom is another winner in the Capital Crimes series. Once it was a swamp. Now Foggy Bottom is swimming with real-estate sharks. When a man is found stabbed to death in this trendy D.C. neighborhood, it is major news. But within forty-eight hours the nation is gripped by a fear that leaves this comparatively small crime in the dark. Three passenger planes are shot out of the sky. Everywhere–in law enforcement, in the media, and in the most secret realms of government–men and women scramble to find out who shot hand-held missiles at the planes, and why. It is a search that reaches from Moscow to the Pacific Northwest, putting some people's lives in jeopardy and turning others lives inside out. But no one can guess the truth: that the epicenter of the terrorist outbreak is Washington D.C. . . . and a dead man behind a park bench in a place called Foggy Bottom.